After decades of investing, building, and scaling software companies, BootstrapLabs realized in late 2015 that the world was about to enter a renaissance era for Artificial Intelligence, powered by an explosion of data, plummeting storage costs, increasing connectivity speed, and affordable processing power growing exponentially. BootstrapLabs has since become one of the most active and respected early stage venture capital firms in Applied Artificial Intelligence, and its community of executives, founders, researchers and investors has grown to over 40,000. Our weekly Applied AI Digest newsletter is read by over 4,000 members, and approximately 2,000 attendees joined our annual Applied AI conferences, quarterly Applied AI Insiders Series, and workshops in the last two years. Artificial intelligence could add as much as $15.7 trillion – about the combined output of China and India – to the global economy by 2030 but the road ahead will not be without major hurdles. In 2017, VCs invested $10.8 Billion in AI & Machine Learning companies globally and the sector saw over 200 M&A deals in the last 5 years. This is just the tip of the iceberg as most Fortune 1000 corporations will be playing catch-up for many years to come. Entire industries will be transformed by the power of Artificial Intelligence and tomorrow’s winner are being created today. We wish you a fantastic start to 2018. 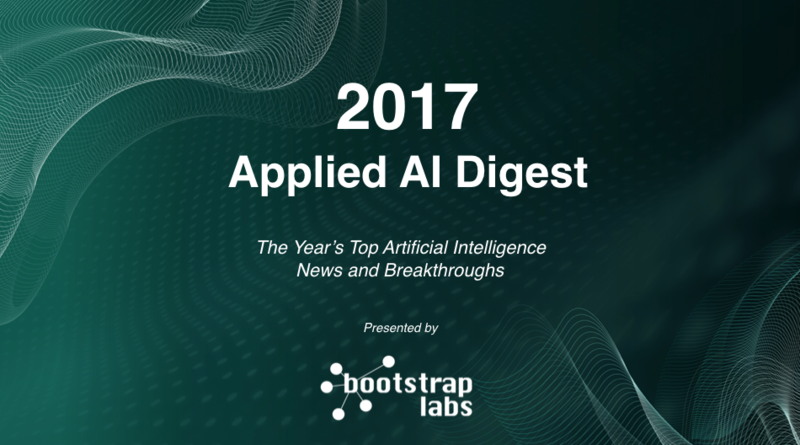 To inspire you, we thought we would share our 2nd Annual Applied AI Digest Review Presentation – a recap of all the major AI news and trends of 2017.